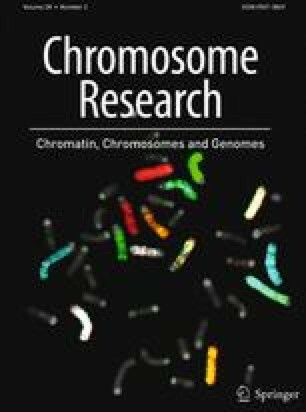 An automatic, computer-aided method for identification of rice chromosomes was developed based on image parameters obtained by image analysis. Numerical data of the 360 condensation patterns (CPs) or the density profiles of rice chromosomes obtained from 30 chromosomal spreads of haploid rice were subjected to three different discrimination methods for identifying the chromosome: (1) discrimination flow chart, (2) linear discrimination functions, and (3) minimum distance classifer based on standardized Euclidean distance. Discrimination based on the minimum distance classifier resulted in the correct identification of more than 92% of the rice chromosomes. The first and second methods gave a correct identification of 91% and 84%, respectively. It is concluded that the 12 rice chromosomes in most spreads could be identified by a computer.